They were supposed to be a place where women in distress could live a life of dignity, can rehabilitate themselves economically and emotionally, but instead shelter homes for women are turning out to be brothels. A social audit by a Mumbai-based Tata Institute of Social Sciences (TISS) brought to light the sexual abuse of 34 girls at government-run shelter home for girls in Muzaffarpur, Bihar. It was followed by another case in Deoria in UP where a 10-year-old girl escaped a shelter home and exposed the exploitation of the girls who lived there. These incidences have left the country startled, but sadly aren’t new. Shelter homes in India are run under the Swadhar Greh scheme – an amalgamation of Short Stay Home scheme and Swadhar scheme, set up by department of social welfare and department of women and development, respectively in 1969 and 2001. Also, girls up to the age of 18 years and boys up to the age of 8 years are allowed to stay with their mother in a Swadhar Greh. India has a total of 551 shelter homes under Swadhar Greh scheme. 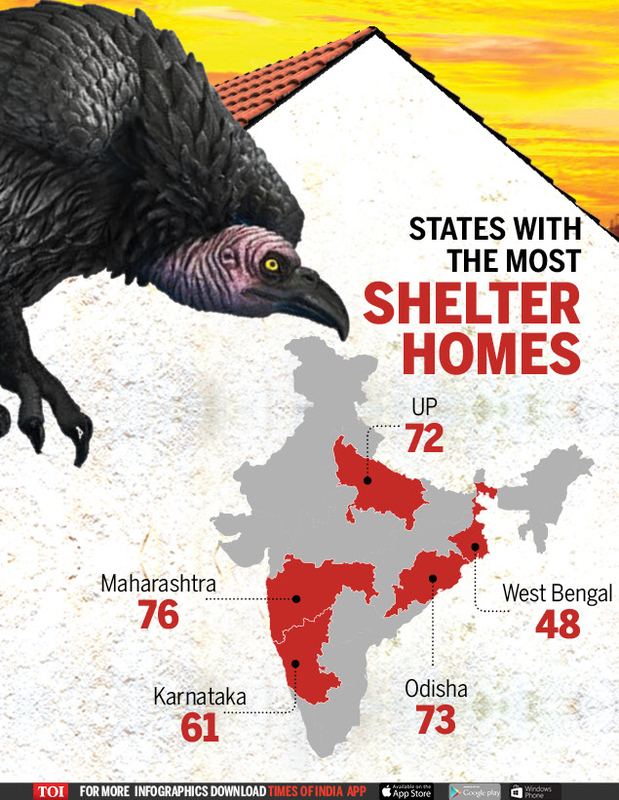 Maharashtra has most number of shelter homes, followed by Odisha and UP. As per Juvenile Justice Act 2015 registration of all children homes with state is mandatory. After the Muzaffarpur and Deoria incidents, the Women and Child Development Ministry (WCD) has stepped up action and asked all states to verify homes and ordered a verification of all homes in states. But this is an ongoing process. The move aims to check the misuse of government grants for shelter homes and bring more in more accountability. But the task is huge and one that needs sensitisation and therein lies the challenge.